Trail maps usually list the length of the trail followed by the difficulty. In this case, things seemed normal. There were three levels of difficulty; Easy, Moderate, and Difficult. The map showed “Trail: 1.2 Miles; Difficulty: Difficult; Elevation Change: 800 Feet”. In my mind it said, “Trail: 1.2 Miles“… A walk in the park. In New Mexico, every single element here is out to kill you. There is no soft cushion of grass or a nice tree limb out there to hold you up when you fall. If there is, there is a rattlesnake in that grass and a black widow in that tree. I had forgotten what an unrelenting place this is. Soft and well worn Colorado spoiled me. No worries about cactus and yucca, just big wide trails. Colorado does have some tough trails made for equally tough people. I know trails that have taken lives. Each time I hit a “trail” in New Mexico, I find myself surprised. However, it is no surprise to me that the fishing a quarter of a mile upstream is so good, if you make it alive. Looking over the map, lights turned green and I was off with haste. Within 5 minutes I was bleeding and suffering from a twisted ankle. 10 minutes, torn shirt and bruised elbow. 1 hour, soaked from the shoulder down. 1 hour and 10 seconds, the smile on my face would not go away. As I chased fish too big for the stream down river, I dropped into holes that instantly dropped four to five feet from ankle deep. I was wet and sore, bleeding and smiling, cold and thinking. Losing track of time is not alright when you are deep in a canyon. The sun sets at five and sunset is closer to six, giving a false idea of how much light you have left. With the idea that the trail is 1.2 miles, I poked around the stream a fraction of a bit too long, the fishing was almost too good. 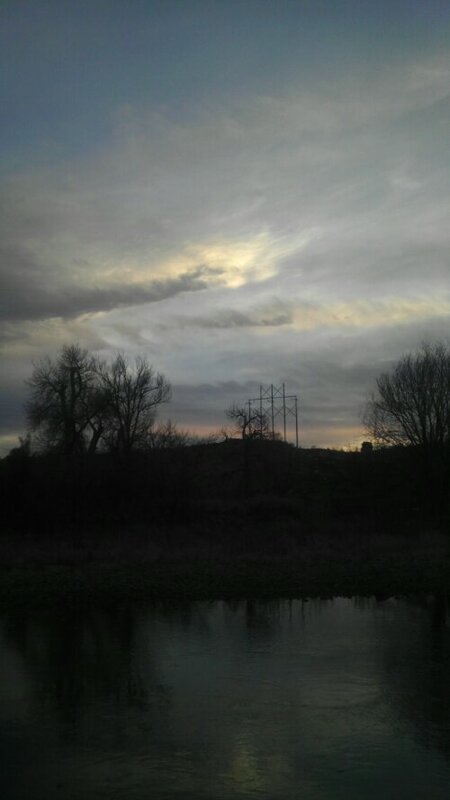 Before long, I was fishing in the actual sunset and light faded quickly. Not knowing where exactly I was, I figured simply hiking up the steep hill behind me would reveal the trail. 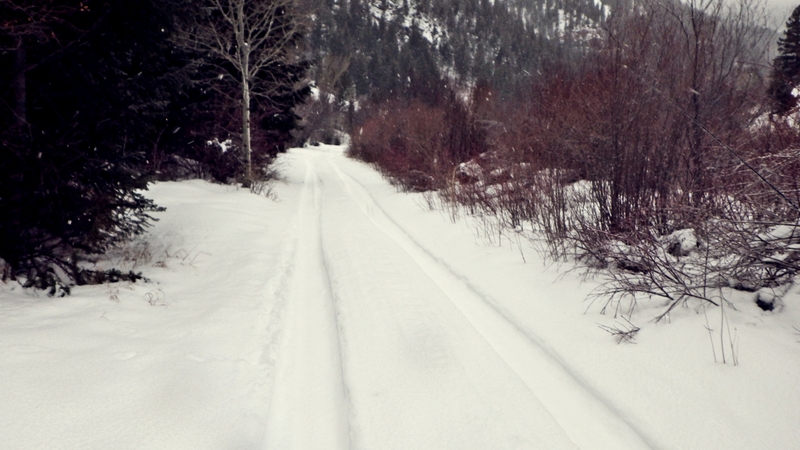 A shortcut, back country style. When I could see the point, to my right, there was also another parking lot. I had hiked in well over a mile upstream. I remembered passing a large dead ponderosa and could see it in the distance, but light was fading fast. 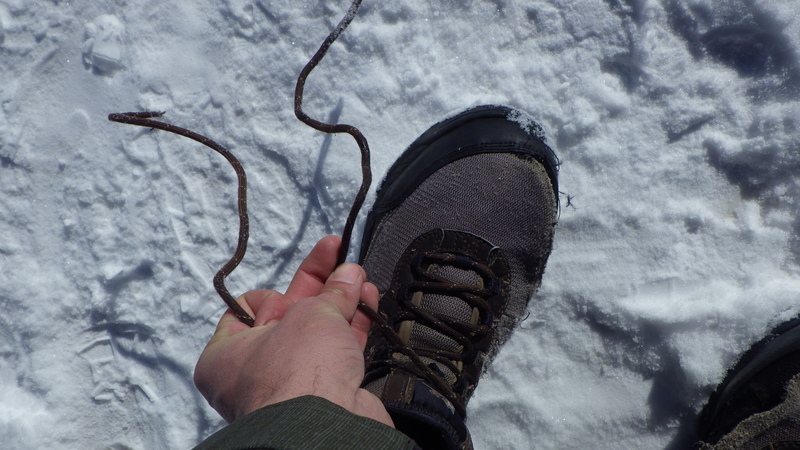 It was time to put the screws to the hike. 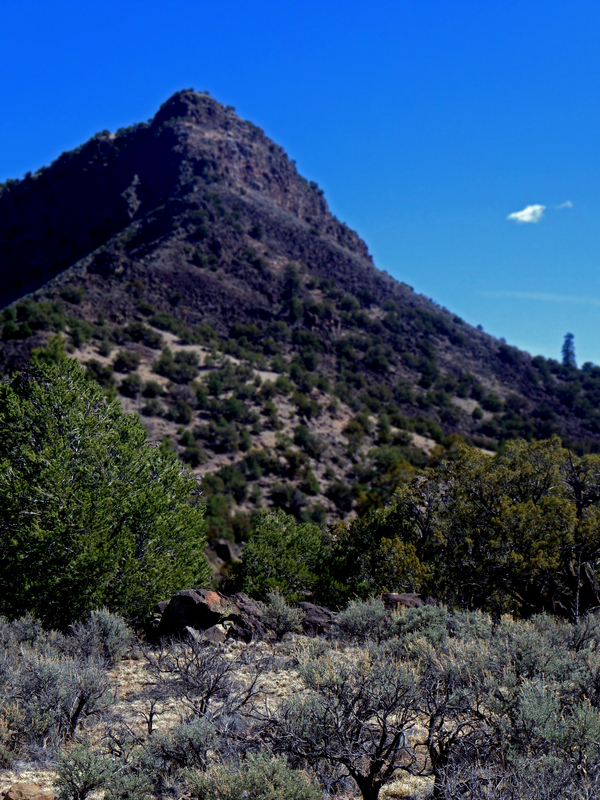 Scrambling over sage and cactus, the incline began to become steeper with each step. Then again, the burning in my legs could have simulated the effect. 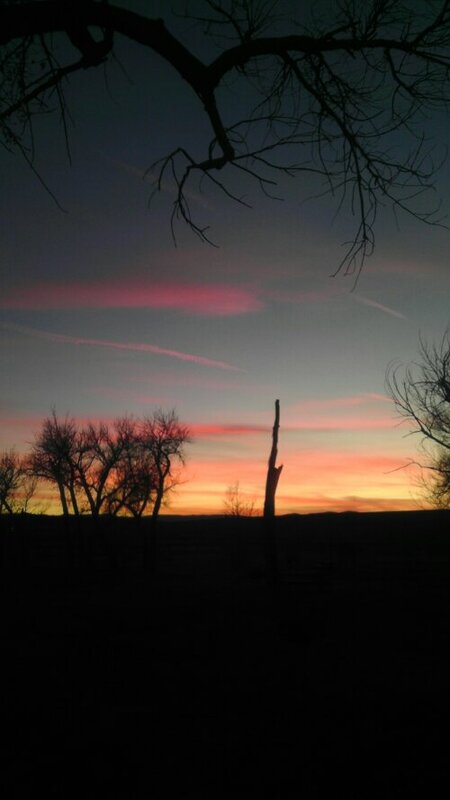 When in peril, sunsets begin to fade exponentially. The same can be said about life. They say that just before you die, your life flashes before your eyes. I began to think that if your life flashes before your eyes like the fading twilight, the time is not nearly long enough. Before I die, I want to relive my life entirely or not at all. Every scratch, bruise, the time I crashed my bike for the first time, when I laid in some long lost trail for hours not able to move on, the heartbreaks, and every moment in between. They also say hindsight is 20/20, but no matter how well we can see something we can not feel it, nor can we bring it back. If we planned it all to work out perfectly in the end, where would we be in life. If we saw the future, we would know what to expect and every moment leading to that one event and would be diminished by knowing. I had found my old tree. It came to me then, the tree never asked to be in this place. It just happened to tumble here and take root. Such is life. We can plan and make goals, but our actions do not make our future position. Our lives are one big beautiful tumbling accident. Sometimes, we take root and grow where we never expected. If we try to change it, our roots will be in sand and we will not be able to grow to our full potential. The thermometer in my car read -3 degrees. The snow fell relentlessly as I curled up in my driver seat, praying that my heater would miraculously spring back to life to warm bones that reflected the outside temperature. I shivered knowing that I shouldn’t, my body had no sugars to process for heat. Hours ago, the sun had already made its way over the pass with ease. Something that, in the moment preceding hypothermia, my car and I envied. If I could just make it over the pass and get moving, heat would slowly pour through the vents and save my life. That was only a wish. I covered myself with a slew of winter gear and waited for the sun to make its way over the pass yet again to warm not only the road, but my slowly fading body heat. Years ago, while running a guitar shop in Las Cruces, a very warm day brought on a cold revelation. Sitting outside I watched a truck barreling down the road driving at a speed around 70mph in a 35mph zone. Before I could contemplate what a terrible and careless driver this man was, I heard something that sounded like an explosion. I ran to the sound and aid of someone that I had never known. When I had arrived, it was too late and the speeding driver opened his door to find the man who I never knew lying in his own back seat, passing into another world. The man was probably on his way somewhere, never thinking the place he was headed would no longer involve a car. The driver sat on a curb waiting for judgement to be passed upon him as well. I turned and walked away after a short statement. It was in that moment I realized no matter how safe you think you are, your card can be pulled in an instant at any given time. The thermometer read -12 and inside my car was not much warmer. I rubbed my hands together to generate heat for my slowly numbing fingertips. Out of nowhere, I felt an audible chuckle become an uproar of laughter. The movement helped and the laugh originated from the thought of the previous day. The thought of laughter with my friend on the Frying Pan River and my freezing fingertips that day. In fact, the whole trip and the reason I was stranded here in the snow was due to wanting to test a new fly on a river filled with extremely picky fish. 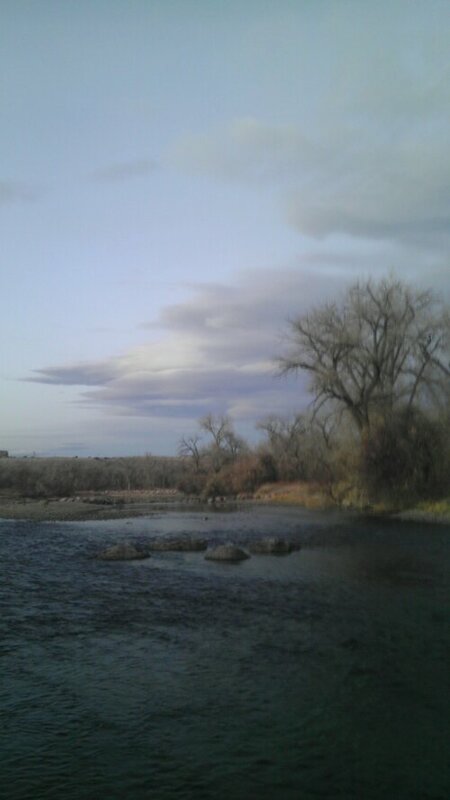 John suggested that we fish the Colorado that morning because he had left his waders in another state, in another car. I somehow talked him into fishing the Pan without the use of waders. While we stood on the banks of the river, fish flew out of the water and we cursed each fish for the taunting. It took a while for us to get into the swing of the river again. For John, it had been three months since he wet his line. For me, I had been fishing the Arkansas tailwater too much. As we changed flies, we picked up the occasional fish, but nothing seemed to work until John switched to a dry, and I to a streamer. The two dumbest flies we could have ever chosen. A “Chewbacca Bugger” and a Parachute Adams were our flies of choice and neither of us expected what was about to happen. 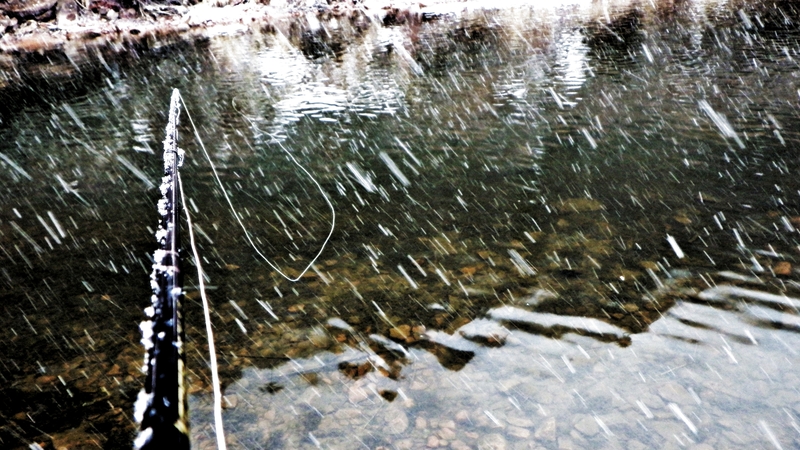 Laughter exploded from the walls of the canyon as we began catching fish that we never thought we would catch on flies we never thought would work, on a snowy February afternoon. That night, John and I ate dinner joking about the waitress the evening before and “Seasoned Fries” that were ordinary fries coated in black pepper.When John asked, she called them “Regular Seasoned Fries” and our confusion as to whether or not they were seasoned or regular was quelled. The food packed my stomach full. As John and I departed, I sat in my car. The last thing I wanted was to drive home in the snow. I threw on my winter gear and drove away unknowingly into a storm. By the time I had pulled out of Glenwood Canyon, I was already worried and running low on gasoline as well as funds in my bank account. The snow began to collect on the road and my car slid aimlessly down the highway, in chaotic control with a white-knuckled driver behind the wheel. 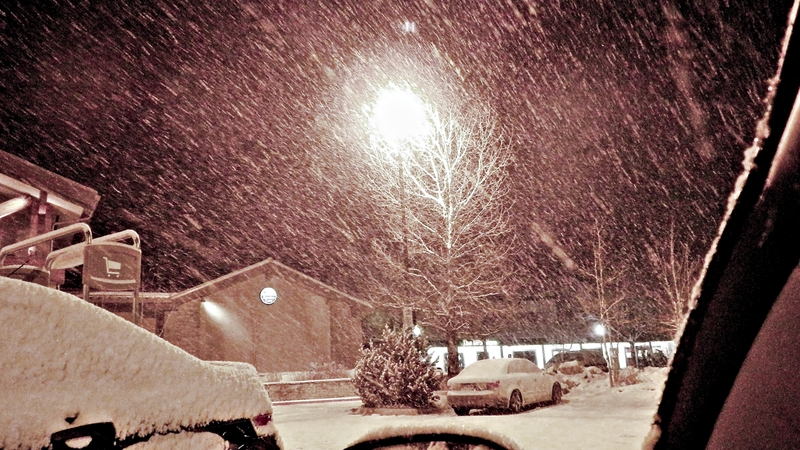 Through the town of Eagle, the snow began worsen. My foggy headlights barely piercing the veil of white that fell before me. Vail pass was next, but before I reached the city of Vail, my car nearly spun out of control. Driving time was over and the only thing possible for me to do was wait in a Safeway (ironic, right?) parking lot. As the hours ticked away and my body temperature dropped, the thought of the previous day eventually put me to sleep. 4:00am -17 degrees… I woke up from the cold with a gasp and subsequent cough. Unable to feel my lips and finding it difficult to move, I got out of my car and walked a lap. With feeling once again in my extremities, I had to move. I had to drive. Leaving the Safeway parking lot was difficult, knowing that I might be stranded on the side of the road rather than a parking lot where I could call for help. Even the snow on the road made it tough. With only a couple of hours of sleep, I found myself spinning my tires up the onramp. Inching closer and closer to my destination, I rocked back and forth trying to push my car up the hill. Movement meant heat. As my car skittered onto the icy highway, I heard a familiar sound. A sound I had not heard in over a month. My heater had kicked on! I turned all of the dials to the hottest possible settings. Slowly, the cab warmed to a temperature capable of baking bread. I basked in its heat and breathed a sigh of relief. It was not my time… yet. With a little bit of determination and a lot of luck, I made it over the pass and down into the town of Silverthorne. At 5am, I knew of a place to sleep until it was warm enough to fish. I did just that. This new day was never supposed to happen. I should have been dead, or at the very least, at work. This day was a new one, the day after I didn’t die. As I cleaned my waders, I thought about the man I had never known. I wondered if he had passed on a day that he truly enjoyed, that was full of love and fulfillment. While fishing that day, I asked the same to myself. The answer was a resounding, “No”. 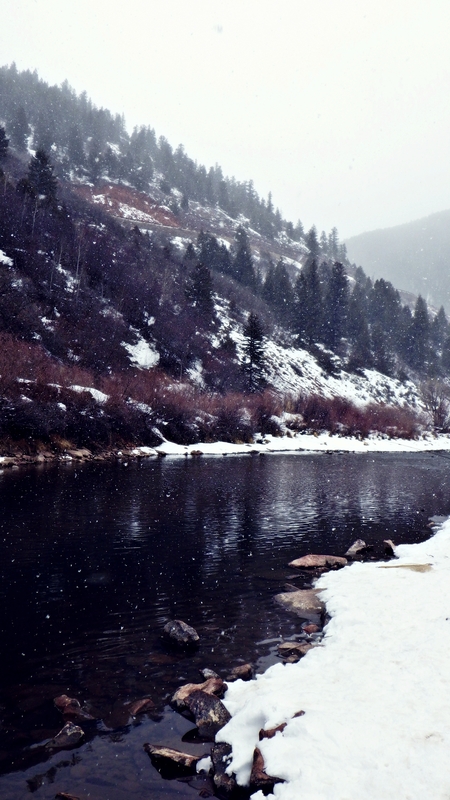 My love is the river, and my heart belongs there, I was born to die on it. With the fresh thought of death in my mind, I realized that the only value of life is to find your fulfillment. The only way to accomplish fulfillment is to chase your dreams. The following day at work, I wrote a letter of resignation. Sometimes when alone, we ask questions we can not answer to things that have no voice. The reasons why the question is announced is often more mysterious than the answer to the question at hand. It becomes philosophy, and more importantly, these philosophical questions lead us to answers that seem more like ambiguous rhetoric. Even the previous statement clearly defines the enigmatic nature of these questions. As complex as the explanation may be, the question is usually a simple one. A, “How did that happen,” or “Why am I here” seems an easy enough question to answer. Upon further examination, any inflection made could change the meaning completely, and becomes the first step down a rabbit hole that continues for a lifetime. Sitting upon a boulder that would be submerged when man forced springtime on the river, unknown bugs were tied to a leader that wasn’t prepared for what was about to happen. These bugs were born from a pile of feathers, copper, steel, and thread with an idea that they would mimic an insect. As they drifted through the gauntlet of multi-directional currents, thoughts drifted through the gauntlet of conflict and doubt in my mind. The world is no longer flat. We have, theoretically or otherwise, defined all that we see. We take this as pure knowledge, but not the existance of other possibilities. As humans we have closed our minds to the pathways that could lead us to new heights. What if we found anti-gravity before the wing or solar energy before coal? How would our world be today if we never split an atom? How did all of this happen? How did I come to be here fishing, seemingly for entertainment purposes that are a way of life? Even the act of fly fishing accidentally began somewhere and the possibilities of what it could have been are endless. We think that our actions are definitive. With the thought that there could be nothing more functional and utilitarian than the car or wheel, the wing and engine, coal and power, we are lost completely. Doomed to be repeating what has been done and perfecting an idea that may not be a perfect one. 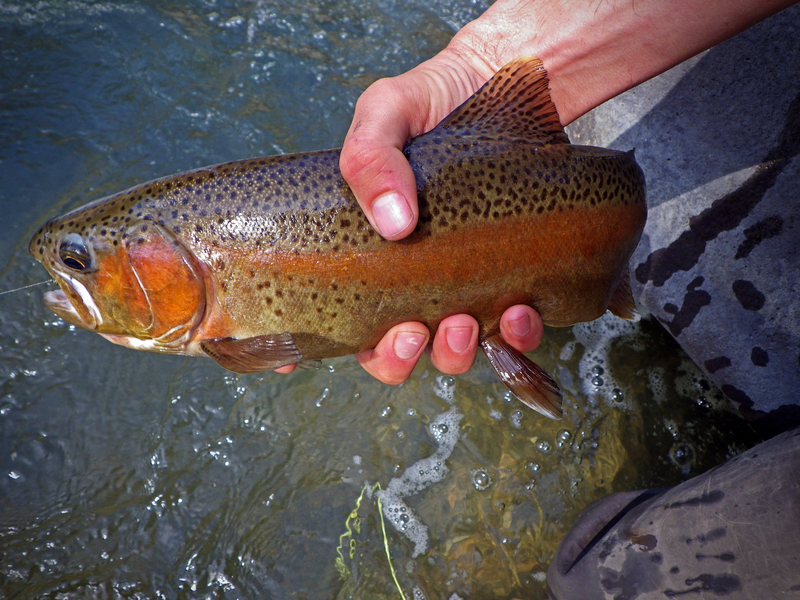 Fly fishing is efficient, using human energy to perform fluid mechanical function. Newtonian physics in the simplest form at all times only to be dropped into chaotic fluid and pressure dynamics. Utilizing the creativity of the human mind to replicate the action of an insect that clumsily survives through its ascent. Occam’s Razor at work. Yet, the variables are too great. To this day, something new is learned on the river each trip. 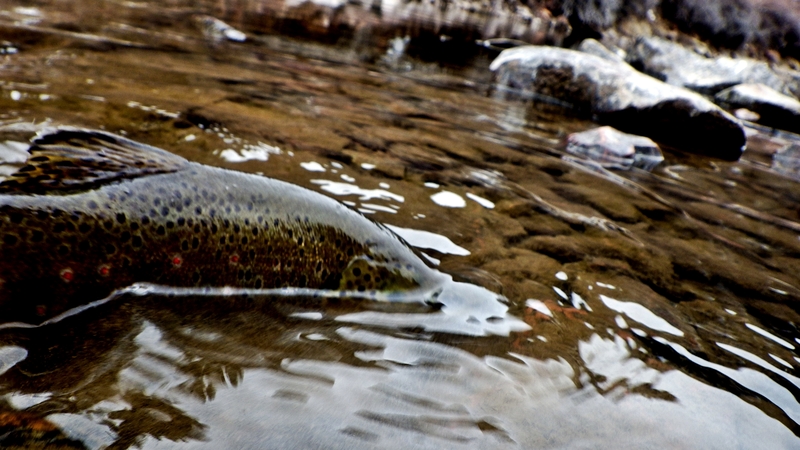 Fly fishing carries a history of at least five hundred years and we still stumble upon new ideas each and every day. 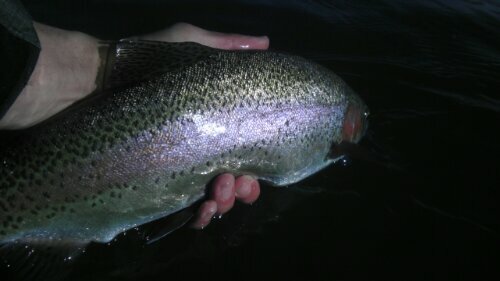 As my mystical fly was drifting through chaotic bliss, it was interrupted by a fish that had mistaken it for being real. As I fought the fish, I thought. Of all the bugs in this river, why this one? Did the fly happen to be drifting perfectly in the current? Was it the perfect color or action? Maybe it was an accident and happenstance. No matter the case, as a fly fishing community, we should look at the way we tie and the way fish see to ultimately determine why fish feed on the end of your line. Today, as I write, I have no idea as to the purpose of it, or why I choose to be sitting in this chair. I do know the events leading up to this simple action, but upon deeper inspection, every action in life lead me to this point. Even reading this, your whole life lead to this very moment. Every wrong turn and every delay in traffic brought you right here right now. The moments after are being shaped by the time it takes to read this. Call it fate or divine intervention. To me, even if the other two are involved, it seems like a heck of a lot of accidents and happenstance. I’ve seen your face before. It shows scars from your past well. Well enough that I can see them from across the river. Upon that upper lip, a black scar from years ago, showed an age beyond your own. Possibly a scar that signified a wayward treble hook that dangled behind a flashing treat. Adolescent and naiive, you took the bait, was mistreated, and now you bear the scar for life. A scar of the wise. In my life I have come across thousands of your kind, thousands that only carry a handful of dispositions. There are the shakers that slosh the surface spitting water every which direction but never really go far. There are the runners that swim upstream at a breakneck pace, frustrating the fisherman with break-offs. Then there are the acrobats, who are tricky at times with their high flying antics, but easily manipulated to net. The stones, who find the deepest current and rest, which cause fisherman to second guess. The flailers, who like getting hooks wrapped around rocks and in weeds while vigorously trying to shake out the hook. With all these, there can be mixtures of sorts, and some more unique than others. Then there is you. In my years, I have never met a fish like you. You showed your power, your arrogance. You knew, and this is the third time we have met. I know that scar, and each time it feels like you want me to see it. Like you want me to know it is you. I know where you reside, and with your size and stature, you can be dominant over your territory without an issue. You live on the fast side of 20 rock. A rock so-called because of your brutish friends that live in the current break. Not choosing that as your feeding ground, you took to the point side, the first to the conveyor belt of food that deposits behind 20 rock. Safe from fisherman. An impossible drift to achieve naturally. I found a way with a quick double mend and you have found my fly for the third time. I am a glutton for punishment. 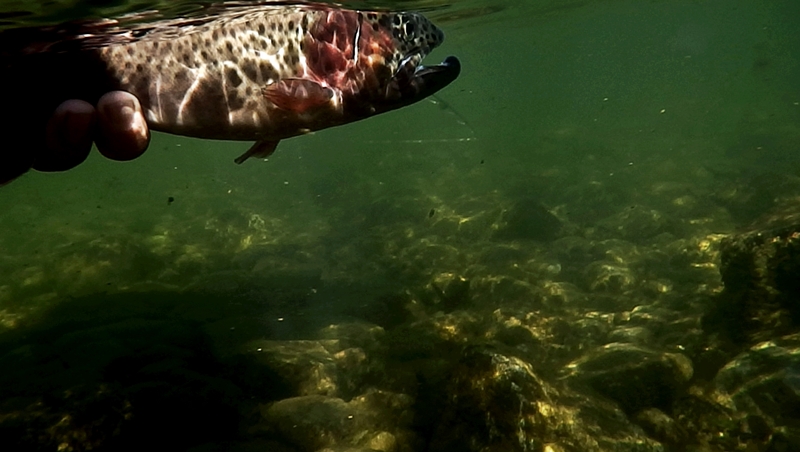 The first time, you swam upstream with all of the power of your predecessor, the salmon. You raised your head across the shallows before you found a way to shake my fly. I saw the scar then, as I did today. The second time, I almost had you, ten feet away, you layed on your side in defeat as I pulled you in. I got a closer look at the scar before you shot down into the deep and off with my fly. It was that day I saw your size, an astonishing double digit weight and nearly 25 inches, even that may be an understatement. The third time, we knew each other, we knew our history. The battle was not epic. It was not one that got my heart racing. I knew it was you when I set the hook. A firm set into a heavyweight, in an instant you maneuvered yourself downstream. Close enough to the surface that my line whistled as it split the air. Enough energy to confuse the novice and buy you time to dislodge the hook. I kept tension against you as you dove to the bottom. Your easiest way out, a place where you knew well that you could apply weight to tire me out. We sat for a minute in a stalemate while I put a near breaking tension upon you. You waited in your comfort zone. Out of nowhere, I felt you begin to rise, out of your own admission, out of free-will. I was confused. Your shape began to take form in the more shallow water, but you swam steadfast, without a stressor, as though my hook were not even there. Your fins cut the surface of the water and I was in awe. You lifted your massive head out of the water like a silent submarine. That eye, that deep, aged, sunken eye looked at me. Like you committed me to memory and marked me as your enemy. A conscious effort was put forth on your part, you knew who I was and wanted me to know. It was that moment of realization when you turned your head to dive back into the abyss, that you showed me again, the scar. Purposefully and dutifully extracting the hook from your disfigured jaw. One of these days we will meet again. Upon our distant perspective it all seems normal and calm. The cool breeze flipping leaves of trees and swaying grass to an unknown symphony. The river, the illustrious conductor to the life around and inside of it. However, upon closer inspection, a war tears at its very delicate fabric. A war keeps it alive. The walls of an unknown city rise from the ground, holding soldiers within. Millions of warriors who are controlled in numbers by unknown gods as they are forced down a road to the east, to a coast they have seen before. They are carried here on the wind, but today, the wind brings a new army. The war drums sound across the horizon, moved forward by chariots with legs of light that scorch the earth beneath their powerful foot falls. Their legs literally ripping the air apart as they move and the size of the army behind them moves so swiftly that they move the air around them. Peacefully, the walled city rests. Praying for the destruction of the walls. One day they will fall. One by one, line after line they are released upon the road that they once knew so well. The road giving up its treasure as I am the only stranger who walks it. The only stranger that knows its secrets. I stayed for the spoils of war. The River is code named “Lost and Found” after Annette and the fact that this river is so overlooked. The day started early after an all night snoring competition between John and I. If there was a ranking system for snoring, I’m sure I know the top 10 competitors in the world and he and I would rank in the top 5. As it stands, the winner is still yet to be determined as there was no “official” judge. Without a hitch we were off to fish while other campers dreamed of home after a long weekend that seemed a great idea at the time, but after a few days in the forest with family, things get rough. We looked over the river with great anticipation saw fish from the road as we geared up. They were feeding. They were massive. They were ripe for the picking and it wasn’t long before John’s resident skills paid off. The fish here surprised me everytime, like hooking into a freight train moving solidly up a hill. Not only that, but these fish were brilliant swimmers to the extreme and put a wicked bend in the Sage One that it has never seen. The rod did play the larger fish better than I thought it would. Still, even with its superb construction, I lost fish and flies by the dozens. Some fish would strike so hard and so fast that they would break the 6x tippet before I even realized a fish had taken the fly. Frustrating. After some time, I did begin to find the groove and landed some of my own. Days 1 and 2 on “Lost and Found” drained the life from me. Between the sun, extremely difficult terrain, fighting fish, and casting, everything hurt. I even felt as though my rod was starting to feel lethargic, on the last limb, ready to throw in the towel, or die trying. Every step worth every cast worth every fish. Toward the end of the second day, I found the hole of holes on the river. I deemed it “The Chute”. It was the last pocket of water twenty feet from some wicked whitewater. Let me give you a quick rundown of fish before I explain the difficulty here. The fish in the river were averaging 16-19″ and a 12-14″ fish was around one in ten. 20″+ fish were about one in three and nearly impossible to land. For the days we were here, I needed to land a 20. So many times I set the hook into them. So many times I caught a glimpse of the fish before it was gone forever into the depths of Lost and Found. 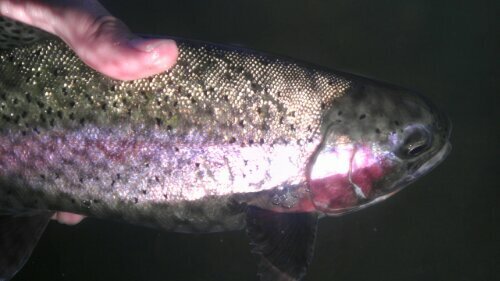 I cast into The Chute and pulled out a few fish (most importantly one containing 2 of John’s flies from the previous day), but there was one I that nearly gave me a heart attack. I saw a flash and set, solid hook set, no movement. I thought I had been snagged on a rock until I moved forward and saw its back vaguely beneath the current. It was a fish and it had the Hail Mary locked in its jaw. I pulled harder lifting the fishes head into the current. It did not like that at all. Off it went. 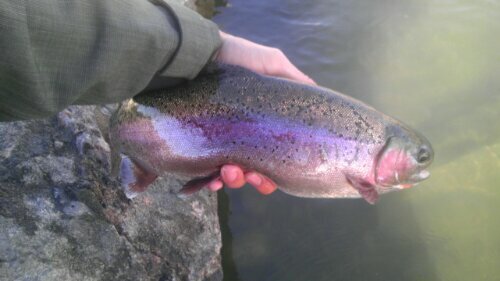 It is said that a rainbow trout can accelerate to 23mph in one second. This fish easily broke that record and flew through the air like a salmon trying to get to his headwaters to spawn. My reel screamed in pain as the fish swam full speed down The Chute and into the deep run 50 yards downstream as I gave chase on land at a much slower pace. I made it to a slow pool along the run to work the fish. 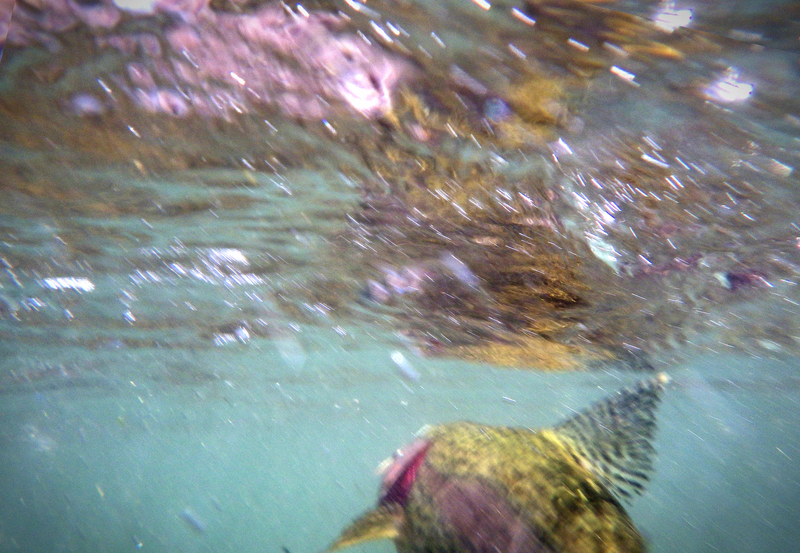 As I was settling in, the fish violently shook its head and both my flies and fish were gone. It was time to go. We moved on, to higher country.